Clear out Welenkin Cove and eliminate the Sea Sload B'Korgen. The Divine Prosecution has charged me with clearing out Welenkin Cove and eliminating the threat posed by B'Korgen, the Sea Sload alchemist. Speak to Justiciar Farowel in Alinor and accept the task. 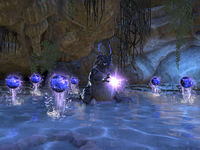 Travel to Welenkin Cove and destroy the corrupted coral. Defeat the Sea Sload B'Korgen. Return to Farowel for your reward. Speak to Justiciar Farowel in Alinor to start the quest. You need to go to Welenkin Cove and defeat the Sea Sload B'Korgen. You will also need to find 6 pieces of Tainted Coral, which are located in the area around Welenkin Cove (not in the cove itself). The pieces are quite large and hard to miss. They also have flies buzzing around them. When you have completed the quest objectives, return to Justiciar Farowel and talk to her to complete the quest. I need to head for Welenkin Cove, west of Alinor, and destroy any patches of tainted coral I come upon. Then I need to kill the Sea Sload alchemist that calls itself B'Korgen. Finishes quest I killed B'Korgen the Sea Sload and destroyed the patches of coral the creature corrupted. Now I should return to Justiciar Farowel and claim my reward.